Fresh out of my oven! 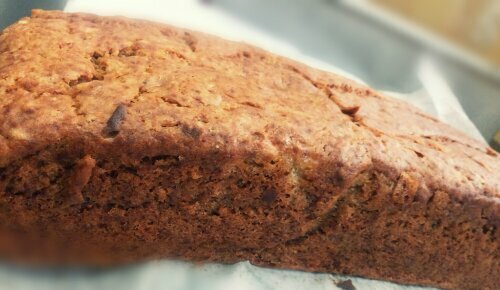 Delicious banana bread! S and I went for tea to a friend’s place on Sunday. They live on this gorgeous farm, about 30 minutes away from the city, and right on the banks of the river Mahi. Its a gorgeous place, so quiet and peaceful. They do a lot of organic farming and even supply fresh milk which is completely untouched. I haven’t tried it yet but I am looking forward to it. In case you need more information about the farm and its products, the link is here. His wife had made an absolutely delicious banana cake. It had no frosting but was so moist and delicious! I knew I had to make it.. She was gracious enough to share the recipe with me and I was super excited to try it out. It helps that I had extremely over ripe bananas which is exactly what I needed for this recipe. 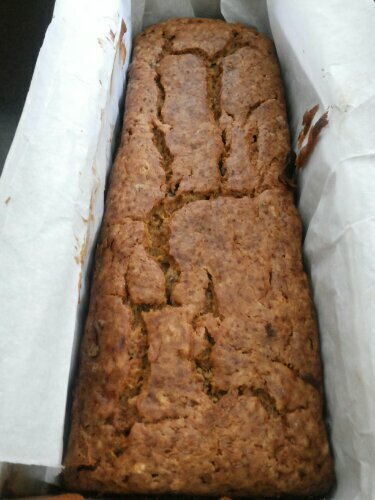 I decided to make it in a loaf tin so that I can send it to Bombay easily. Here are some pictures of it fresh out of the oven! Recipe follows. Recipe from a very gracious friend! Preheat an oven to 200 degrees celsius or 375 degrees Fahrenheit. Sift the flour, baking soda, baking powder and salt and leave aside. In another bowl, cream the butter with the sugar until light and fluffy. Add the beaten eggs one at a time, beating well after each addition. If using, add the chopped walnuts and the cashew nut powder at this point. Add the honey and give the mixture a stir. I added 1 tsp of ground cinnamon to the batter to give it an extra cinnamon flavor. Fold in the flour gently at this point until it is just moistened. Pour the batter into the prepared tin and bake it in the preheated oven for 35-40 minutes or until a toothpick inserted in the center comes out clean. Allow the bread to cool in the loaf tin for 7 minutes and then turn out onto to a wire rack to cool completely. While the bread is cooling, mix the powdered sugar and cinnamon in a separate bowl. Before serving, ensure that the banana bread is completely cooled. Dust the bread with the sugar and cinnamon mixture and cut into slices to serve! This is an absolutely delicious accompaniment to tea and coffee and is very child-friendly. Since it doesn’t have any frosting, it is relatively lower in fat. You can add less sugar if you wish to cut back on calories and want to have a slightly less sweet bread. This bread will freeze well and can stay for up to a month in the freezer. If you wish to unfreeze it, allow it to sit out for about an hour and a half and pop it into an oven at the ‘warm’ setting at 100 degrees Celsius for about an hour. Cover the bread in foil before popping into the oven.